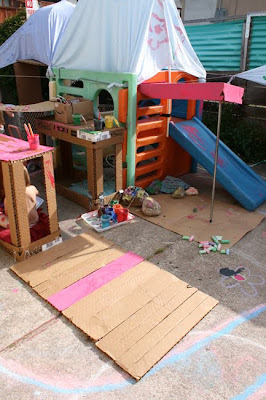 All that cardboard from the end of the last post was used today and yesterday to construct a whopping mess in the yard. A gorgeous mess mind you! I was sad to have to bring a lot of it in tonight (we are supposed to get rain). 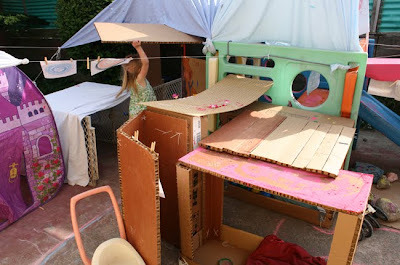 Bedsheets, pvc plumbing pipes, clothes pegs, gaffer tape, electrical tape, string, rope, an old hula hoop and a golfing umbrella, other misc, lots of cardboard and lots of paint! We had help from three other familys over the course of the two days to play, build and decorate, and some very sunny weather, so it was nice and relaxed. 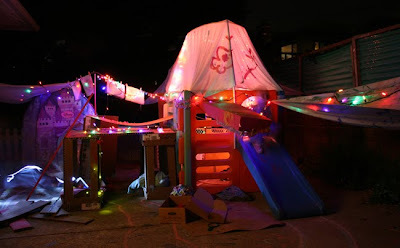 They made artwork with my lazy suzan to put up as kind of prayer flags, and when it got dark tonight, we let them stay up late to play with toches in the cardboard city with the christmas lights all around. Paul read them their bedtime story in there too. They really wanted to camp out, so I think we need to find a proper tent asap! This looks so fun! I love that you aren't afraid to get everything completely messy and crazy. 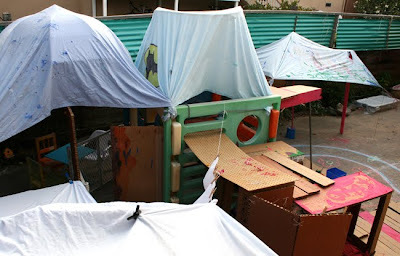 I can't tell you how much I'm loving what your kids are doing - it is amazing :) Who wouldn't want their very own shanty town in the backyard! That is so awesome! 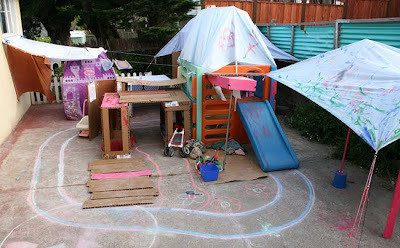 What a boon to your children to have the opportunity to create their own town. Rock on, sister! Saving holiday lights for holidays is such a waste. I'm so happy to see the hammer out. What an incredible, collaborative experience. 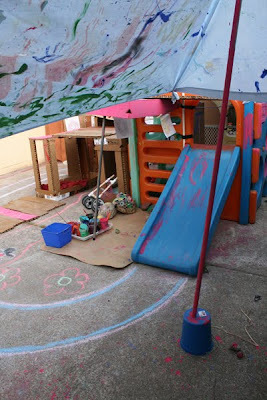 I have to say that we sometimes get things going similar to this at the preschool, but you get a special star for doing it in your backyard. You are rapidly becoming one of my heroes! It's certainly prettier at night, with the Christmas lights :) What fun, though - my kids would love it! That is fantastic. I really love how spontaneous and natural the things you do with your children are. It's very inspiring and giving me many ideas. The picture with the Christmas lights is beautiful! How fun for your girls! 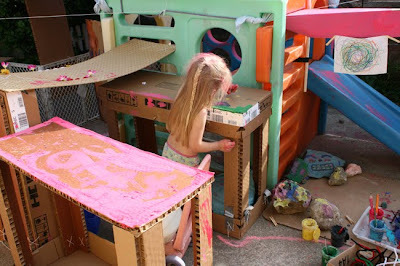 Can I say that your kids are pretty much the most blessed ones on the planet when it comes to free, creative play? You are absolutely brilliant. The ideas on your blog are 100 times better than what I see in magazines. Please tell me you are planning on publishing a collection of these because you deserve to make profit. Wow! That is awesome! It looks so magical at night with the lights. Sad you had to bring it down for the rain. 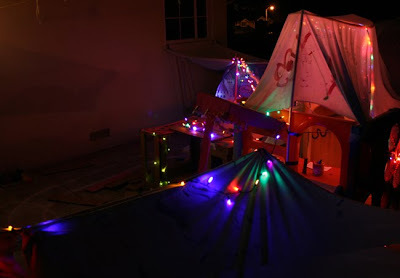 The Shantytown at night looks so inviting! 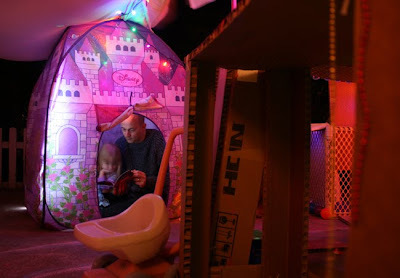 It glows and invites you to stop for a rest and a good picture book! 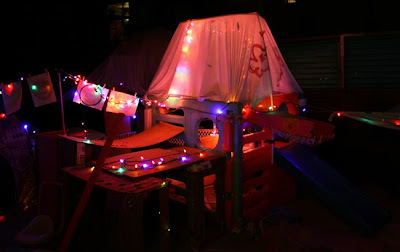 I especially love the way this looks all lit up at night - what fun your kids get to have! This looks so darn cool! 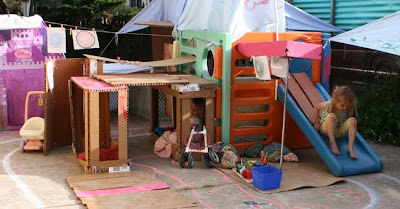 I wish I had such creative parents who would've let me do these things! Love the pics with the twinkly lights the best. love it...My cousin's kids have been hounding me to save all of my costco boxes for something similiar. yours is definitely gone to the next level!!! 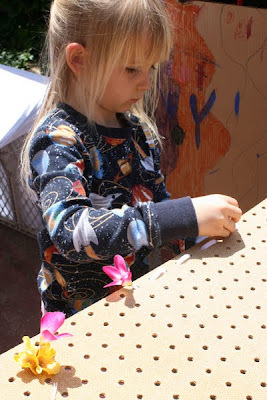 !love the peg board idea.. we will have to have some for our flower collection!!! !thanks for the idea!!! 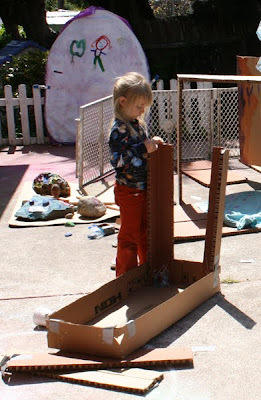 Gave you a shout-out on my blog- Creative and Curious kids today. You've inspired us! Thanks a bunch! That is so inspiring. There are not many mothers that would allow their kids to do that. You are such a great mother! She learned more form that than she would learn in 1 week at a school. oh my, that is so fun!! 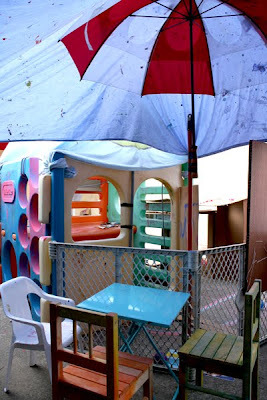 they really had a great time and made a wonderful play space. So fun! I'm absolutely in love with your blog and all your wonderful projects. I discovered your blog through another and I'm just DELIGHTED that I did! I plan on stopping back in a bunch! Ok, I don't know why I am even commenting because I don't know what to say. I am at a loss for words (insert roars of laughter from my family here). 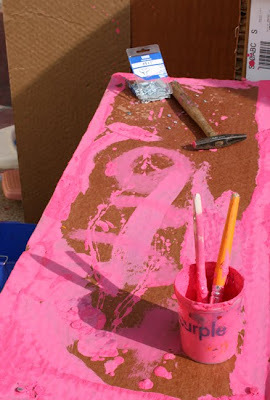 I was given the link to your blog because of the plastic bag fusing instructions an I cannot leave it now! You are sooooo creative! My.jaw goes lower to the floor with very post I read! I love seeing the pics of your girls helping make these things an enjoying the outcome. So happy I was turned on to your blog!